The idea of a hex key, a small L-shaped tool designed to drive different sized screws and bolts with their heads imbedded with hexagonal sockets, was first conceived around the 1860s. Lack of manufacturing options stalled production until 1910, when the Allen Manufacturing Company developed a cold-forming technique and quickly registered the trademark name “Allen Wrench” to describe the company’s clever little tool. Soon after, competitors in America and Europe fell over themselves to bring copycat tools to market, which have generally been referred to as Hex Keys ever since. Now, they are everywhere and have quickly become indispensable tools for professional mechanics and DIY enthusiasts the world over. We have looked at dozens of these tools and have created a handy guide to help you choose the best hex key set for your particular needs. One of the most affordable and highly rated allen key set available, this two-pack from TEXTON includes SAE (inches) and Metric keys. The set offers amazing value with each offering 13 keys. Longtime customers have come to appreciate TEXTON for its manufacturing prowess, and this set is no exception. Each of the keys benefits from the manufacturing process, which uses chrome vanadium steel, heat-treated to deliver years of stress-free performance. There are 13 SAE hex keys of the following sizes: 3/64, 1/16, 5/64, 3/32, 7/64, 1/8, 9/64, 5/32, 3/16, 7/32, 1/4, 5/16, 3/8 inch. 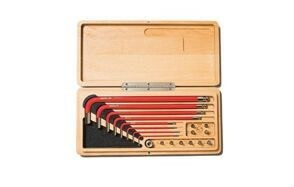 The Metric set includes the following hex keys: 1.27, 1.5, 2, 2.5, 3, 3.5, 4, 4.5, 5, 5.5, 6, 8, and 10 mm. What else makes the TEKTON Long Arm Ball End Hex Key Wrench Set your best choice? Obstructions that get in the way of a damaged socket cap screw is a thing of the past, thanks to the design of the ball end, which allows for a 25-degree angle entry. The hex key ends are precisely chamfered, allowing them slide without friction into the fastener in question. This lessens wear on the key and eliminates potential damage of the fastener. Unlike competing products, which are made layer upon layer, the TEKTRON keys feature a black oxide finish on the steel surface to prevent chipping or flaking with repeated use. Greater reach and leverage. The short-arm and long-arm design of the L-wrenches offers a combination of reach and more torque. Each key is easy to identify, as the metric sizes come in a red case and the inch sizes in a black housing for storage. Easily organized for fast retrieval. The housing unit is hinged and opens flat, meaning it is easier to grab a wrench as needed. The key sizes are also on each case. The repairs and other tasks you can handle with the TEKTON Long Arm Ball End Hex Key Wrench Set are fixing your car or motorcycle, or even making repairs or adjustments to other tools in your collection. Any tool that you use should be cared for appropriately, and a hex key set is no different. When not in use, the wrenches should be stored in any case or pouch they came with – otherwise, place them in a drawer, separate from other tools as they may be easy to miss if mixed in with larger tools. Because there always is the danger of steel tools rusting over time, your L-wrenches should be stored someplace dry – preferably in their own case or a secured tool chest. Another idea is to repurpose the silica packs you sometimes receive in deliveries – they are great as a cheap rust inhibitor. If your L-wrenches do get wet, dry them as soon as possible. Simply put, this may be the best hex key set for the money. But what if something goes wrong with your hex key set? Thankfully, TEXTON offers a lifetime warranty against manufacturer’s defects or quality issues. Other companies offer similar product guarantees, but ii always is a good idea to read the “fine print” of the warranty before making a claim. For instance, no warranty will replace an L-wrench that gets snapped in two because you used it in combination with a hammer and a vice grip. Make sure you always keep it handy in your tool bag. Fashioned in the distinctive bright yellow synonymous with Stanley tools, this two-set inches and Metric hex wrench set provides the functionality and durability millions of customers have come to expect from a company with a proud 170-year history. Crafted with rubber inserts to help increase grip, each hex set features chamfered edges for easier entry of the key. Size markings are printed on each body to make them simple to identify when you need to grab the right key quickly and without fail. The SAE (or inches) keys are as follows: 5/64, 3/32, 7/64, 1/8, 9/64, 5/32, 3/16, 7/32, and ¼. The Metric keys come in these sizes: 1.5, 2, 2.5, 3, 4, 5, 6, and 8 mm. Getting the maximum performance from the Stanley set depends on a few different things, perhaps none more important than common sense. First, use the right L-wrench. If the key you have selected is too small, select one larger until you have the right fit.Secondly, to loosen a fastener insert the wrench into the hexagonal cross section of the bolt and turn it counter clockwise until it fully loosens. To tighten the fastener, do the opposite by turning it clockwise. Our handy guide to the best crowbars features more great products like this. If you have a demanding task where maximum torque is necessary, then this 10-piece hex key set from Performance Tool may be just what you are looking for regardless of the repair work being performed. The cushioned grips on each key are form-fitting and comfortable, giving you the ability to exert as much torque as needed when inserting or extracting screws. And because they generate a flywheel effect as they turn, extraction or insertion happens super-fast. The keys are made in America of black, Protanium High Torque Steel and the set is protected with a lifetime warranty. 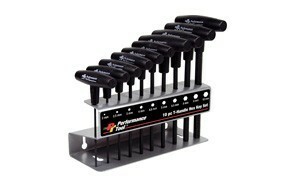 Performance Tool W80275 Set comes with a stand for easy storage and organization, with a spot for each key clearly labeled so they are placed in the proper order when not in use. The keys range in size from two to 10 mm, with the fixed sizes being 2, 2.5, 3, 4, 5, 6, 8, and 10 mm. 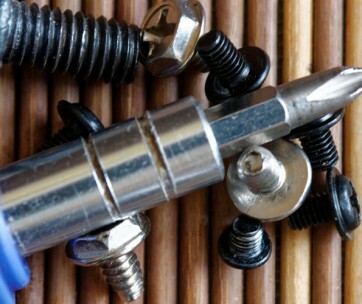 Be sure to also check out our list of the best ratchet screwdrivers for more great items like this. At Bondhus, employees are proud of the company mission: “To provide the very best in products that can help our customer’s in their daily activities and projects.” In that respect, the Bondhus 17095 can proudly exclaim, “Mission accomplished!” Made in the U.S. with the company’s proprietary Protanium® steel, these tools are tougher than most. In fact, about 20 percent tougher, so throw any challenge at them and you will not be disappointed. Each L-wrench is coated with BriteGuard Finish, giving them a bright, professional like-new appearance year after year. For tight spots, the 1.27-10 mm wrenches feature an angle entry of up to 25 degrees, saving you time and effort when trying to reach into deep or darkened locations. Bondhus 17095 Set is an ideal companion for rest of your favorite tools, and will not be out of place for different tasks – repairing your mountain bike, adjusting the mounting rack for your big screen television, and many others. If you are interested in a long allen wrench key set which exemplifies the most important features of such a tool, the XtremepowerUS 45pcs SAE Metric Hex Key Set will not disappoint. 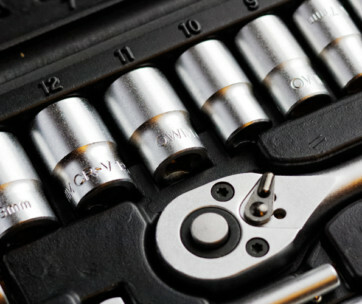 Torque is dependent on the arm length, the smaller keys can accommodate tiny bolt heads, and the keys are L-shaped and can be used from either side. It is important to select an L-wrench that meets your specific needs, which is one reason the XtremepowerUS 45pcs SAE Metric Hex Key Setis such a great option. With all the various SAE and Metric sizes, there is bound to be a hex key for the job you are working on. Something to be aware of is to make certain that whatever set you choose comes with standard sizes specified by SAE International. XtremepowerUS has you covered because its set includes these sizes: 5/32-inch, 3/32-inch, 7/16-inch, 3/16-inch, 1/18-inch and ¼-inch. But whichever hex key you choose depends on the task. For instance, if you are an automotive or bicycle mechanic there is a good chance you will need an SAE set. Light work around the house, like installing a door handle or bathroom fixture, may require a standard set of hex keys. With the XtremepowerUS 45pcs SAE Metric Hex Key Set, you will not have to rush out to buy new wrenches. A worthy tool for your tool box. Still American-made and backed by the company’s legendary Full Lifetime Warranty, the CRAFTSMAN 946006 2 Piece Folding Hex Key Set includes 17 keys in total to cover just about any repair work you can imagine. The two-piece set includes the following sizes: 5/64″, 3/32″, 7/64″, 1/8″, 9/64″, 5/32″, 3/16″, 7/32″, 1/4″, 1.5mm, 2mm, 2.5mm, 3mm, 4mm, 5mm, 6mm, 8mm. The different sized hex keys are a terrific addition to any toolbox, whether you are a professional mechanic or just making small fixes around your home. Either hexagon wrench set is sure to include a key you will need for bolts or screws, and their compact, foldable design makes them easy to carry and store. The handle is made from steel with rubber inserts, ensuring the best grip possible. The CRAFTSMAN 946006 2 Piece Folding Hex Key Set will allow you make quick repairs, from tightening bolts holding pieces of furniture together, to securing bits in a drill, to anything in between. Handy, compact, reliable are three words that come to mind when thinking of these tools, and you will not be disappointed in their price, either. Because this set includes SAE and Metric in standard and even smaller sizes, you should be able to handle other tasks, too. Some of the work you do, such as repairing small consumer electronics or even mobile phones, will require even smaller hex keys so it is a good idea to have a set that covers the basics and then some. Love this product? Check out our review of the best torque wrenches for our top picks. Serious bicyclists know that it is critical to carry the right tools to ensure they get from Point A to Point B in a certain time frame. A high-quality bike pump and CO2 inflator are obvious choices, but do not dismiss another must-have – a hex key set. 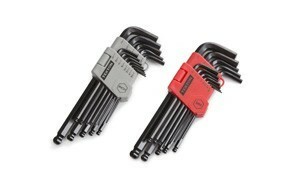 Thankfully, Pro Bike Tool makes one of the best hex key sets on the market, the appropriately named Allen Key Set. Made from shop quality S2 steel, this indispensable tool set includes the L-shaped wrenches you would most likely need to fix your bike: 1.5, 2, 2.5, 3, 4, 5, 6, 8, 10 mm. Weighing in at just over 12 ounces, the tool set fits neatly into an included tool organizer when not in use. Hex key sets are the number one tool used for size adjustments and bike repairs. If you have ever been broken down on the trail or along the side of the road, you know the importance of carrying the right tool, and this set fits the bill. The varying sizes and ball-end tips on the allen keyset long are ideal when you are trying to reach awkwardly located bolt heads. Best of all, either end of the tool can be used, allowing you to extend your reach if necessary and get as much torque as possible. This key set is manufactured to the standards Pro Bike Tool is known for and is further backed by a lifetime warranty against manufacturer defects. Even though this may seem obvious, the Pro Bike set is so useful that you should not need other tools with it. 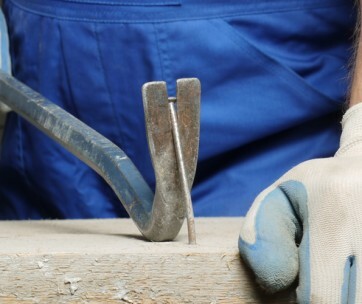 For instance, because most L-wrenches are relatively small compared to other hand tools, you should never hit it with a hammer to create more force. You should never clamp vice grips on it to help create more torque, mostly because a hex key is designed with torque in mind and can do a good enough job on its own if you supply a bit of physical “oomph” when turning it one way or the other. If you are looking for one all wrench set to rule them all, then the Lichamp 18-Piece Hex Key Set may be a great candidate. Designed and engineered to fill multiple roles, the set can easily accommodate most chores for household repairs – including furniture assembly, small appliances work, installing bathroom accessories, installing door handles of interior and exterior doors, bicycle repairs, equipment repair, and even basic automotive and small electronic repairs. The set features Metric and SAE keys, with nine each: 1/16, 5/64, 3/32, 1/8, 5/32, 3/16, 1/4, 5/16, 3/8 inch, and 1.5, 2, 2.5, 3, 4, 5, 6, 8, 10 mm. Precision-sized with chamfered ends, the keys are guaranteed to insert smoothly into the fastener head and will extend service life and reduce wear even from daily use. Each ball-end design wrench is engineered to produce amazing torque and range, giving the set wide latitude in terms of the tasks it can accomplish. The set is made from chrome vanadium steel, with each piece heat-treated to foster corrosion resistance and decades of use. A key use for this hex key set may be in furniture assembly or repair because of the wide range of SAE and Metric size keys that are included. Many retailers like Ikea include one hex key which can be used to assemble an entire suite of bedroom furniture, but what if you lose it? Instead of trudging across town, or even to another state, it is a better idea to have your own set on hand just in case. Don’t forget to also check our guide to the best hammer drills. Made by a company that was founded in 1917 outside Milan, Italy, the SILCA HX-ONE Home Essential KIT contains the high-quality hex key set and bit drivers that are critical for any home mechanic or pro tour bicycle mechanic. Contained within a CNC-machined Beechwood case, each of the 19 components are made in the USA from S2 steel, assuring longevity and performance from one generation to the next. Examined up close, you will notice the detail that has gone not only into machining the keys and bits, but also the case – which could be mistaken as heirloom quality. In fact, the case is at home on a workbench or coffee table. The hex keys and the bits are examples of steel-artistry in motion. The hex key set includes wrenches that are sized as2, 2.5, 3, 4, 5, 6, 8 and 10mm; the S2 stainless steel bit adaptor converts 6mm to a standard 1/4 -inch bit; the S2 steel Torx® bits are T8, T10, T15, T20, T25 and T30; and the S2 steel Screw bits are PH1, PH2, SL4 and SL5. One useful feature of hex key sets not often talked about is their use in picking locks of all sorts. Professional locksmiths swear by their usefulness, and for good reason. But they are a tool so useful anyone could keep a small set with them for just such an occasion. If you have lost your house key, a small and long enough L-wrench is ideal for probing the key hole and unlocking the handle with patience and a bit of luck. The SILCA HX-ONE Home Essential KIT can be the first truly useful tool set you buy, and is worth the investment.